Advertise your site for as little as $79 per month. We are now accepting 120x120 or 160x160 GIF and JPG ads to be displayed on the right column of the entire site. The ads will rotate upward each time the page is loaded to ensure each advertiser gets equal exposure on the top of the page. Each Banner Ad is guaranteed to be displayed 400,000 times per month. 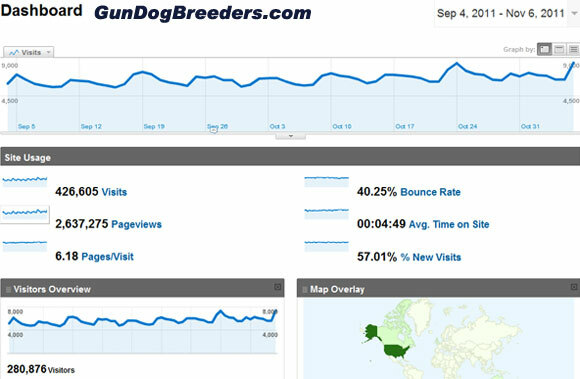 GunDogBreeders.com receives over 1.3 million pageviews every month. We can guarantee that your banner ad will be viewed a minimum of 400,000 times. We are clearly the #1 gun dog site online. Choose From 4 Different Payment Options. Create your ad and make changes anytime you want. With our easy ad management system you can upload new ads or edit existing ads anytime. Advertise a hunting related product or service. create an advertiser account here. Existing Gun Dog Breeders can login to their existing account and simply click the "My Ads" link to get started. Need help creating a banner? click here to contact us about helping you create a banner ad. Please indicate which size banner you would like to create.